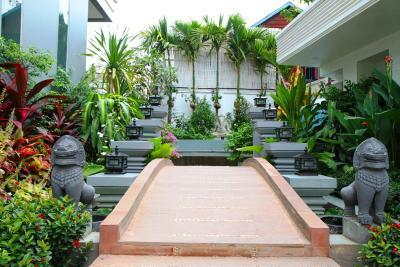 Lock in a great price for Bayon Boutique – rated 8.7 by recent guests! The location was nice. It was set away from pub street but close enough to walk to. LOVED that there was a real deal laundry cafe right on the corner! Great location near pub street and old market, friendly staff. The room is a bit old but big and confortable. Very central and the room was very spacious and nice. Room was huge. Bathroom was huge. Breakfast was ok.staff were great. Lots close by. Huge rooms, fabulous bathrooms ideal for sharing (double sinks, separate tub/shower, etc. ), delicious welcome drink (still trying to figure out the recipe), excellent massages (extremely affordable), the best location (very near all the fun, but very peaceful). Room was nice and comfortable with A/C. Staff very friendly. Wasn't my favorite place to stay during my whole trip, which included places in Vietnam. 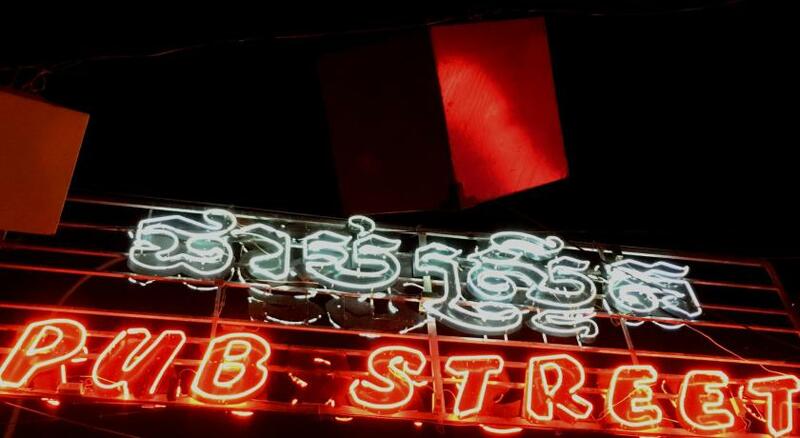 Would recommend this place if looking for somewhere affordable and close to the night market. I really liked that the night market was so close by, was a nice walk in the evenings. Had made arrangements with the hotel for pickup from the airport and ended up having to pay for our own taxi to take us to the hotel, as we could not find our driver. Granted, our flight was delayed and we eneded up getting in later than planned. 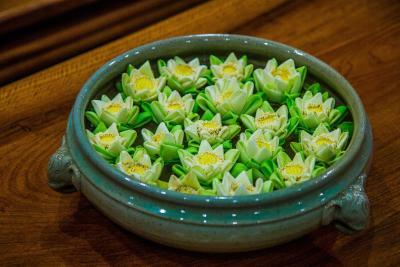 Also, made arrangements through the hotel for transportation to and from Angkor Wat. This was a bit overpriced compared to what we were paying for transportation in Vietnam. Felt we could have gotten cheaper transport for things. Other than that it was an ok stay. Again, not my favorite place out of all the places we stayed during our trip to Southeast Asia. Very good location. Big room. Clean. Helpful staff. Big room with balcony, swimming pool was great after hot days out. 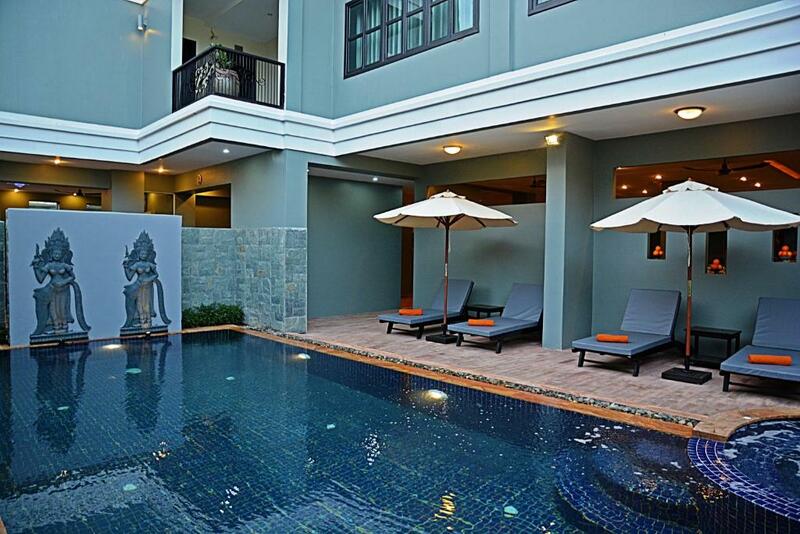 Bayon Boutique This rating is a reflection of how the property compares to the industry standard when it comes to price, facilities and services available. It's based on a self-evaluation by the property. Use this rating to help choose your stay! 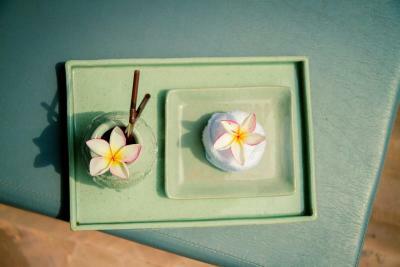 Featuring a terrace, Bayon Boutique offers modern accommodations in Siem Reap. 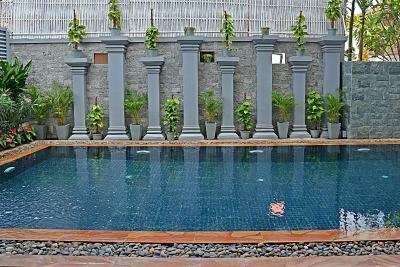 Guests enjoy access to the property's Khmer-inspired outdoor swimming pool. 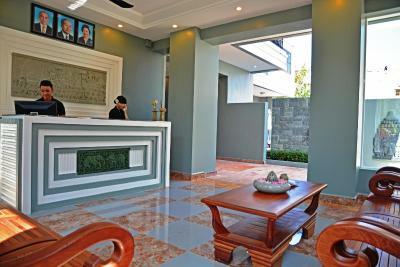 With a restaurant and massage facilities, the property offers a free one-way pick up service from the Siem Reap Airport. Free WiFi is available in all rooms. Offering a balcony that opens up to city views, the air-conditioned rooms include a mini-bar and a flat-screen TV with cable channels. The private bathroom has a shower, hairdryer and free toiletries. Bayon Boutique is 1,300 feet from Pub Street. 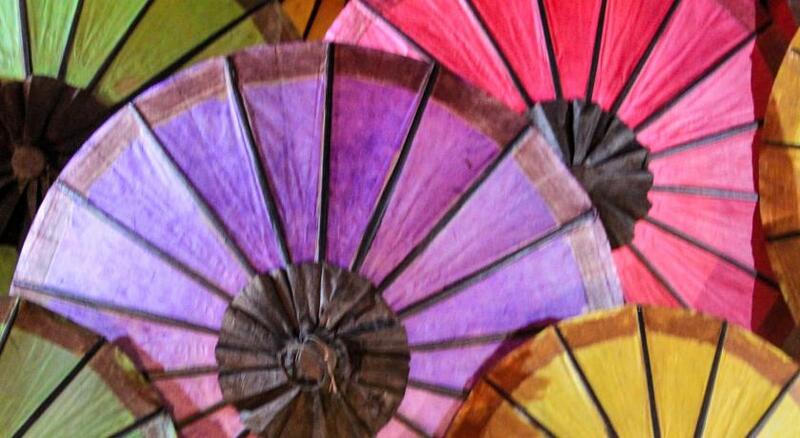 Artisans D’Angkor and Angkor Night Market are 650 feet away. 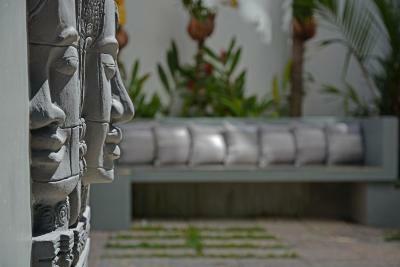 When would you like to stay at Bayon Boutique? Featuring a balcony with city views, this air-conditioned twin room includes a flat-screen TV with cable channels. The large bathroom includes shower facilities. This air-conditioned suite features a private balcony that opens up to views of the city. It is fitted with a flat-screen cable TV and an private bathroom with shower facilities. Featuring a balcony with city views, this air-conditioned double room includes a flat-screen TV with cable channels. The large bathroom includes shower facilities. This spacious air-conditioned family suite features a private balcony that opens up to views of the city. It is fitted with a flat-screen cable TV and an private bathroom with shower facilities. 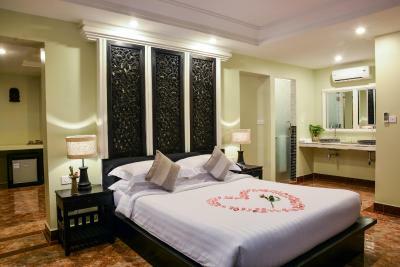 Bayon Boutique offers 18 beautifully decorated rooms & suites according to a contemporary Khmer style with references to the Angkorian architecture of the Bayon. Situated in the heart of the city, an easy walk to Pub Street, and Old Market. 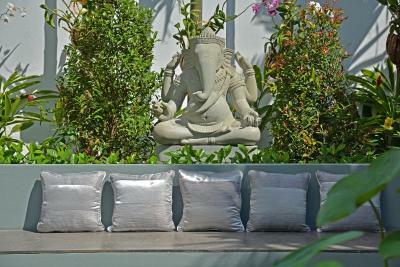 House Rules Bayon Boutique takes special requests – add in the next step! Bayon Boutique accepts these cards and reserves the right to temporarily hold an amount prior to arrival. 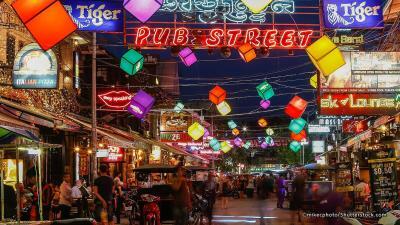 Please note that the property offers complimentary pickup services from the airport by Remork (Tuk Tuk). 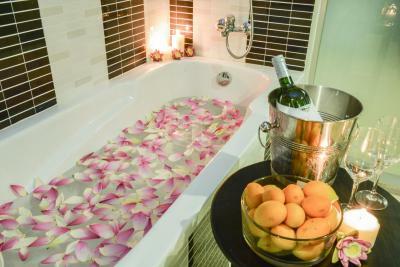 Guests are required to provide arrival details in advance using the Special Requests box provided. 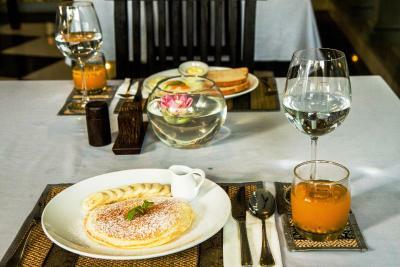 Guests have a choice to dine in or take away for breakfast at Victory Gate Restaurant. 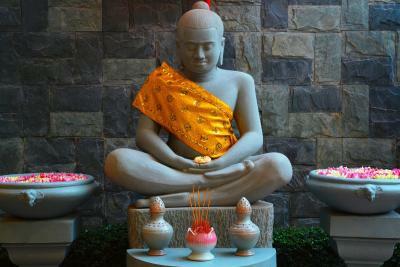 Please inform Bayon Boutique of your expected arrival time in advance. You can use the Special Requests box when booking, or contact the property directly using the contact details in your confirmation. The school next to hotel creates a lot of noise. 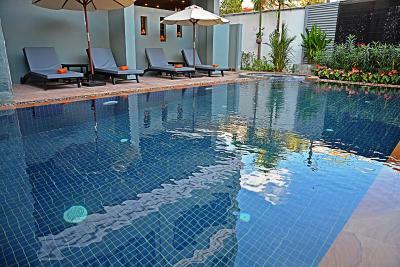 The location was great, the rooms were big and well maintained, nice swimming pool. The noise from school. The breakfast and the air-conditioned. Location. The room. The staff. The pool. Quite over priced. Hallways a bit dingy with couches that were saggy- not as clean and sharp looking as the photos. I was never able to get my room cool enough even with the air con on all night long. The hotel is right next to a school for younger kids. Very noisy and they ring a gong-like bell every hour or so. If you want to sleep in, this isn’t a good place to stay. It was so-so and not worth the money paid. Not clean at all, breakfast was poor and not buffet, no mineral water included. The room doesn’t felt comfortable. 5 minute walk from the Main Street. Loud neighbourhood - nearby school is open from 6:30 AM to 7:30 PM and generates a lot of noise. Pick up from the airport and hotel pool. Breakfast is extra, which is a shame. Pool quite small. Large comfortable bed. Wifi okay. Staff seemed inexperienced and disengaged. It may be due to language. There was too much chlorine in the pool. 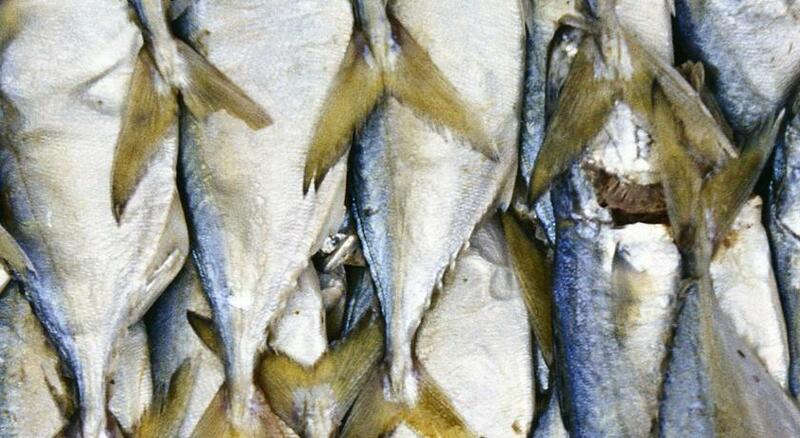 It almost felt poisonous breathing in the chlorine gas. We had a very generously sized room with separate living and bedroom and separate toilets and showers. It was in a central location. Great value for money. May improve Hotel breakfast & Wifi. Spacious, clean & comfort room. Great location & very near to Pub Street. Everything! The room was big and confortable, the bathroom was huge and awesom. Shower was perfect. The staff very amable and helpfull. Highly recommend! The hotel was close to a school so a bit noisy and the bathroom had an awful smell.